Made by Momo: Tuesday Challenge "Spots and Dots"
Tuesday Challenge "Spots and Dots"
Its that time again for another Tuesday Challenge!!! This month's giveaway is a Cindy Loo Cricut Cartridge! If you participated last challenge and you participate again you will have 2 chances to win!!! The winner will be announced on June 29th! This weeks challenge is "Spots and Dots"!! Have fun with it and I can't wait to see what you come up with. It's ok if you dont have a blog, email your project to madebymomo@yahoo.com and I will link it for you. 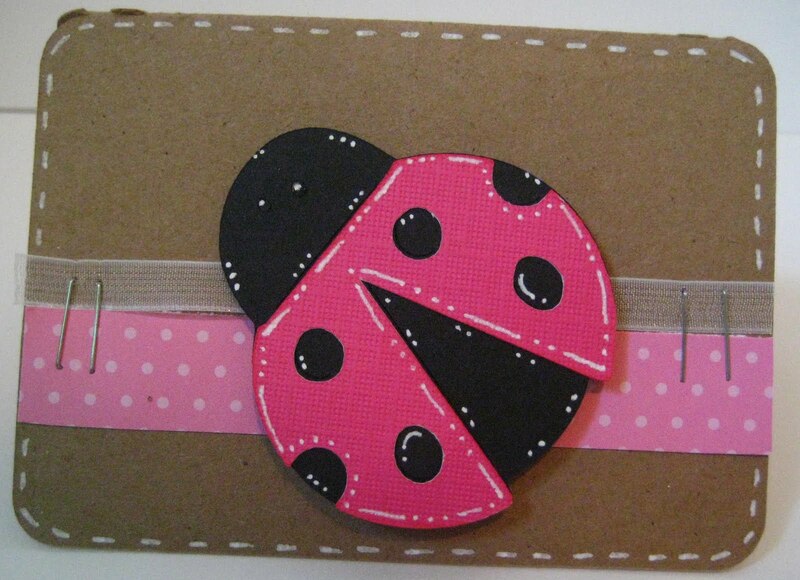 Joanna made a Gift Card Holder using an adorable ladybug! CLICK HERE to jump to her blog. 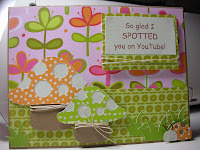 Trisha made a bright and fun Pull Out Card! CLICK HERE to head on over to her blog! Then Sarah made this stinkin adorable card! CLICK HERE to visit her! Hope you guys enjoy this challenge. Link your projects to Mr. Linky below! Thanks for the challenge! I took a very simple route, but think it turned out OK. Look forward to seeing all the others. all the cards are very pretty, Kevin F, did a great job on his band aid card. I love all the projects. I used the cuttlebug swiss dots folder and used some light blue swiss dots paper with a cute bear. I'm loving everybody's projects! Nobody can go wrong with polka-dots! Thanks Momo! I really had fun with this challenge! I just entered! This was a fun challenge for me! I just linked up my card....fun challegne. I hope I win....I'm dying for that cartridge. Thanks for the chance to win such an awesome prize! I love it when I can create a fun item for a challenge and give it to a friend!!! Thanks!!! I love your videos! You have such a sweet and fun loving personality! Your husband and Hero are super cool too. Thanks for all the time you put into bringing us great tips and inspiration! God bless you! I like all the cards. great inspiration. I made mine very simple. thanks for the challenge!! I had fun. Thanks for another great challenge! I am loving the inpirational projects! Thanks for all your inspiration Momo. I love your work. I would normally be concerned if I was seeing spots - but in this case, I'm delighted!! Great projects! Thanks for letting me join the fun! thanks momo for the chance to win! this was a fun challenge. you're the best! This was a great challenge and I had so much fun with it. Thanks for the chance to win cindy loo. Love your blog. Here's a different 4th of July card. I thing it fits the challenge just fine. Hope u like it. I had fun with this one. I left it really simple, but it's definitely spotted and dotted. Well, I had fun with the layout, and I am proud that I actually shared it - my little blog is often neglected by me, as is my scrapbooking and card making. I hope that by joining in on these challenges, I might get inspired again! Thanks Momo! Yikes, I accidently linked mine twice! :S first one was wrong... Thanks for the Challenge MOMO!! LOVE THIS ONE! Ps. I will gladly win the cindy loo cartridge :P.. hehe, thanks for all the fun! Great theme for a challenge! And thanks for such a great prize!! Hi Momo - I was able to participate in your challenge this week. Hope you like the projects I came up with. I just linked up my ladybug card. Fun idea! Thanks for the challenge! It was my first, and I really enjoyed participating and checking out the other projects--there are so many talented crafters here, and I'm following so many blogs now I'll never be able to read them all! Thanks for the wonderful challenge, I hope I did it right. Found your site yesterday with the CNS Blog hop and I just love your blog. I enjoyed this challenge so much as well as the hop! Everyone did such a great job - thanks so much! I went crazy with the challenge and the spots, dots and circles! Love the challenges they push our creativity!! Got this in just in the nick of time. I used my Cuttlebug Spots & Dots embossing folder for the first time. Not exactly creative for the use of spots and dots because it does the work for me but the card turned out cute none the less. Enjoy your challenges, Momo. Thanks for this challenge. Great fun!!! Thanks for this challenge. I had a blast doing it. Thanks for the fun challenge. I was able to incorporate the theme into my scrapbooking project. And double Thanks for the opportunity of winning such an amazing prize!